This week’s l’Espresso features Berlusconi getting ‘clowned’ (as old school hip hop might have it) by the US, via the leaked Embassy cables. Coverage is running in English as well, and the magazine promises to publish more than 4,000 cables this week. It’s interesting to see this perspective, and to read it in English, but as is usually the case with Italian journalism, it is so heavily politicized that’s it difficult to know what to make of it. Published by the same group that puts out the daily la Repubblica, both publications are rabidly anti-Berlusconi. That is the first issue. The second, which is more interesting, lies in how Italy sees the US and how the US might see Italy. There is a component of Italian society that is extremely distrustful of American materialism on both the political left (PCI) and right (MSI), both in some ways informed by Catholicism. Berlusconi made it acceptable to flaunt wealth, especially if it was made by dint of ingenuity — one reason why the American press, even on the left, is much less reflexively anti-Berlusconi that similar British publications. In Italy, Berlusconi’s self-made image and aggressive pursuit of material goods give him (and the city he comes from) an American flavor. Whether heartland Americans would be able to forgive his amorous pursuits or turn a blind eye to rewriting of Italian laws at any opportunity is unlikely — Berlusconi is entirely an Italian creature who could not have come to be or could not have survived in any other political reality. But in Italy, there is something American about him, as far as Italians see America. As for how Americans see Italy: Italy’s key position in the middle of both Europe and of the Mediterranean has made it strategically important since at least the time of Thucydides and probably longer. The local particulars have varied, of course, and in the last century the existence of West Europe’s biggest communist party set the tone for US-Italian relations from the post-war period until the Berlin Wall fell and with it the First Italian Republic. Interference from a great power in such a valuable piece of real estate is perhaps not welcome, but certainly not unexpected. L’Espresso’s coverage is interesting, but it seems basic misprision of the trade of diplomacy flows through it. After CGIL-led strikes paralyzed FIAT in 1954, American ambassador (and virulent anti-communist) Clare Booth Luce voiced concern to FIAT managing director Vittorio Valetta that communism was continuing to grow in Italy despite millions of dollar in Marshall Plan aid. What right the ambassador had to manage FIAT is disputable — but that the Marshall Plan aid to Italy was an incentive to stop the flow of communism from the east is not. That a half-century later Ambassador Ronald Spogli should seek concessions from Italy — a larger base at Vicenza to house the Army’s African Command — for example is part of the game of diplomacy. 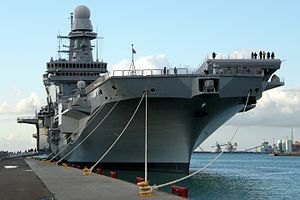 But instead l’Espresso says that “the White House has essentially the same vision as Mussolini: Italy is a natural aircraft carrier in the Mediterranean.” Of course it is; that is a lucky accident of geography. Invoking Mussolini’s comment — which was originally intended to explain why fascist Italy had not build an aircraft carrier — adds an unnecessary level of histrionics to the argument. But this goes with the territory of Italian journalism, whether it’s written in English or its own language (where it reads better, incidentally). Regardless, I look forward to the rest of their coverage. This entry was posted in america, il cav, italy and tagged aircraft carriers, berlusconi, cablegate, diplomacy, l'espresso, mediterranean, mussolini, rubygate, spogli, us strategy. Bookmark the permalink.